PlayStation®4 Exclusive “THE KING OF FIGHTERS XIV” “WORLD PREMIERE TOUR” to be held. 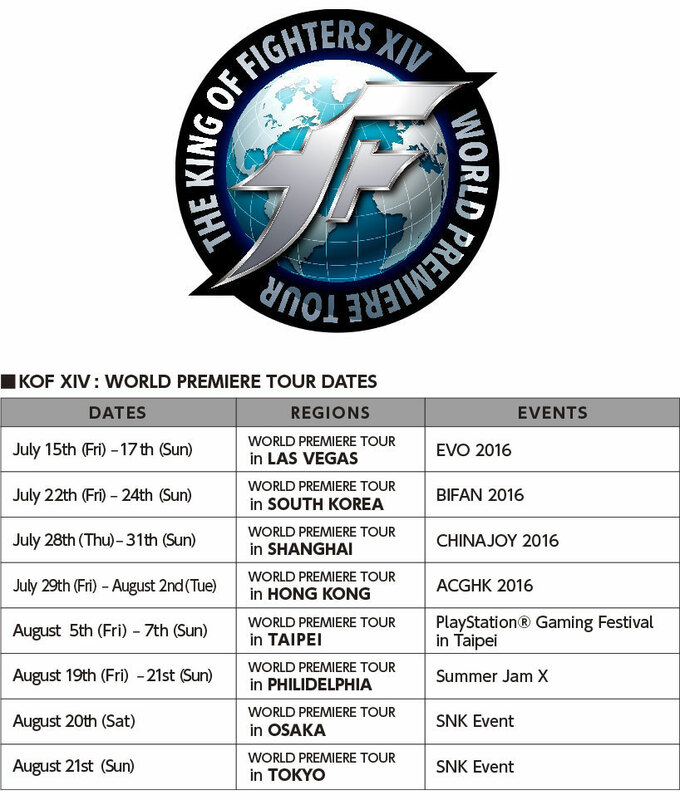 KOF XIV “WORLD PREMIERE TOUR” to be held. SNK PLAYMORE CORPORATION (Corporate HQ: Suita-city, Osaka, Japan, Company President & CEO: Koichi Toyama) is proud to announce The KOF XIV “WORLD PREMIERE TOUR” dates for our PlayStation®4 exclusive title “THE KING OF FIGHTERS XIV”. The final playable KOF XIV build including 48 balanced characters will be available for fans to play. Since Dec. 2015, playable builds of KOF XIV have been exhibited all across the world. However, throughout this upcoming “WORLD PREMIERE TOUR”, the final playable KOF XIV (release version) build including 48 balanced characters will be available for fans to play. We will announce more regions’ dates for the “WORLD PREMIERE TOUR” in the coming weeks. Please do not miss out on this great opportunity to play “THE KING OF FIGHTERS XIV” which has evolved over time, and now in its complete form!